The Ullswater Way is a 20-mile walking route around Ullswater, the Lake District's second largest lake. Find out what there is to see and do on your way round. Located in the north east of the Lake District, Ullswater is often referred to as “England’s most beautiful lake”. Quieter than its larger, more southerly counterpart, Windermere, Ullswater is an ideal destination for holiday getaways. Since the mid 18th century the lake has been sought out by tourists. At approximately 9 miles long and 60m at its deepest point, it is the second largest lake in the English Lake District. Ullswater’s coordinates are 54.5775°N 2.8751°W. The Ullswater Way is a walking route opened on 25th April 2016 and designed to give you the best way to take in Ullswater and the surrounding beauty. Covering 20 miles around the lake, the walk can be undertaken from any point along the way, with the option of spreading the walk out over a few days or shortening the route using the Ullswater Steamers or one of the open top buses that runs along the route. After devastation from flooding caused by Storm Desmond in 2015, the route was developed to show the resilience of the Lakes and tempt tourists back, dismissing the notion that the region was not open for business. With the help of volunteers, paths were improved and new signage and stiles were added to make it easier for walkers to navigate the route. It’s perfect for experienced walkers and more casual ones too. You can take in the sights Ullswater has to offer at a leisurely pace over a few days or with the help of the Ullswater Steamers or open top buses. Or you can power through the route in one day, which should take around 10 hours. In 2018, in response to the popularity of the Ullswater Way’s initial path, an addition to the route was developed. 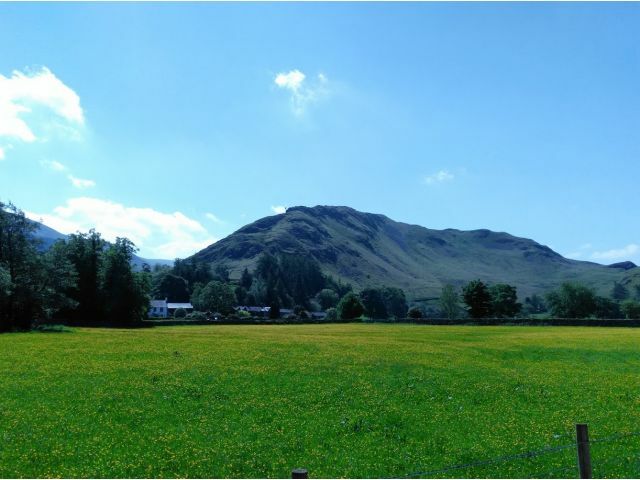 The Dalemain Loop is an additional 5 mile circular loop linking walkers from the Ullswater Way to Dalemain mansion with garden and tea rooms, and the village of Dacre famed for its 12th century church. How do I get to the Ullswater Way? Ready to start your journey along the Ullswater Way? You’ll need to get there first, fortunately Ullswater is easily accessible using a range of different transport options. The nearest town to Ullswater is Penrith, which is only 5½ miles away from the lake’s northernmost point. By train - Unfortunately, Ullswater itself cannot be reached directly by train. However, Penrith North Lakes station can easily be reached with regular trains running daily from London, Manchester, Birmingham, Edinburgh, and Glasgow. As mentioned before, it is possible to get the 508 bus from Penrith rail station to a number of destinations along Ullswater. The 508 bus also makes its way back to Penrith from Windermere station via the same stops. The West Coast mainline operates in the eastern area of the Lake District, connecting Oxenholme, Penrith and Carlisle with Glasgow and London. Direct trains also run from Manchester to Windermere. Local trains stop at Kendal, Staveley and Windermere, routes following the Cumbrian coastline are also available. By taxi - If you find yourself in Penrith between bus times, itching to get to the lake, a taxi to Ullswater will sort you out. Taking a taxi from Penrith to Ullswater should take you approximately 11 minutes depending on where along the lake you’re headed. By car from Penrith - To get to Ullswater from the centre of Penrith by car, first head southeast on Little Dockray towards the A592. Turn right onto the A592 and continue to the roundabout. Take the first exit onto Ullswater Rd (A592). At Skirsgill Interchange, take the 3rd exit onto A66. Then at the roundabout, take the 2nd exit onto A592 and continue to Ullswater. As well as nearly being the biggest lake in the Lake District, there are a few things Ullswater is known for: its views, walking routes, and the highly recommended Ullswater Steamers. The steamers are boats that are a proven tourist attraction, offering trips to and between Glenridding, Aira Force, Pooley Bridge, and Howtown. Circumnavigating Ullswater offers a range of charming locations for you to visit on your way. If you are attacking the route at a more leisurely pace, you’ll want to stop off at the towns and attractions en route to get the most out of the experience. Some of the listed locations may be too much of a detour from the Ullswater Way, but we’re certain you’ll want to come back, so it’s only a matter of time until you take them all in. The charming village of Glenridding is located on the southern shores of Lake Ullswater near the foot of Kirkstone Pass. Glenridding is an excellent starting point for the Ullswater Way. As well as this, two of the main routes up to England’s third-highest mountain, Helvellyn, start from Glenridding offering options for beginner walkers or something more challenging for seasoned walkers. When you reach the top, visibility permitting, you will be treated to breathtaking views across the Lake District to the Solway Firth and Scottish Hills to the north west, the Pennine Way to the north east, North Wales and the Irish Sea to the south and west. A small village to the north of Ullswater, Dacre boasts an impressive history for its size. A Norman church with various items of archaeological importance, including the stone ‘Dacre bears’, stands in the village. As well as this, the 14th-century Dacre Castle remains in excellent condition, just south east of the village. By the River Eamont, is the lovely village of Pooley Bridge at the northern end of Lake Ullswater. Walking through Pooley is a pleasure, taking in historic scenes with a 16th-century bridge built across the river and several old quirky houses opposite the church. A gratifying walk along the waterside from Patterdale to Ullswater is Glencoyne Bay. This area provided the inspiration for William Wordsworth's famous poem, ‘Daffodils‘. William was known for frequent visits to Ullswater with his sister, Dorothy, and composed a number of poems about the scenery, including Aira Force. Located on the west side of Ullswater near Dockray, Aira Force is a National Trust owned site and a must-see for those visiting the area. The family-friendly walk has steps ascending to the spectacular waterfall, where from below a stone footbridge water falls from 72 feet to a rocky pool. It offers a picturesque setting that captures the natural beauty of the Lake District inspiring the likes of William Wordsworth. Located to the east of the lake, Sharrow Bay is a short walk from Howtown, offering dramatic views of woodland and fells. The Sharrow Bay Hotel also features, famed for its afternoon tea which you can sit and enjoy while taking in the views across the water. Once they’ve finished with the Ullswater Way, Lake District walkers may be keen to visit Kirkstone Pass, a mountain pass at an altitude of 1,489 feet (454 m). Connecting Patterdale in the Ullswater Valley to Ambleside in the Rothay Valley, it is the highest pass in the Lake District that is open to cars (A592 Road). In the eastern part of the Lake District is the small village of Patterdale, close to Glenridding, located within the Eden District of Cumbria in the Ullswater Valley. Patterdale is popular with walkers and day trippers. A starting point for numerous fell walks including the Striding Edge path up to Helvellyn, Glenridding Dodd, Place Fell, High Street and nearly all of the peaks in the Helvellyn range. British author and fellwalker, Alfred Wainwright once stated it was his favourite valley in the Lake District. South of the village is the winding main road which leads across Kirkstone Pass to Ambleside and Troutbeck. Once the capital of Cumbria in the 9th and 10th century, Penrith is a historic market town with a selection of interesting and traditional shops, situated less than 5 km (3 miles) outside the border of the Lake District. The beautiful town is the centre of the Eden Valley, Ullswater lake is just 6 miles to the south-west offering a mix of outdoor activities, including kayaking and paddleboarding. Penrith has a rich history, with the ruins of Penrith Castle and the Penrith Beacon, a monument built in 1719 sitting high above the town. The recently restored Penrith museum provides all information on the history and archaeology of the Penrith area. Watermillock is a village that runs alongside Ullswater on its western shore, located between Glenridding and the busy village of Pooley Bridge. A farming community now turned holiday getaway, this is a wonderful base from which to explore the Cumbrian fells, lakes and valleys. Brothers Water is the smallest of the Lake District lakes and is one of the first sights on the descent of the steep Kirkstone pass into the Ullswater valley. The site leads to lovely lakeside and woodland walks with beautiful fell views. Its name comes from the story of two brothers in the 17th century who drowned after falling through ice one winter. The lake is actually in the Hartsop Valley, slightly south of the Ullswater Valley. Grisedale Tarn is a mountain lake, situated 3 miles from Ullswater to the east along the Grisedale Valley. Located between the fells of Dollywaggon Pike to its north, and the bulks of Fairfield and Seat Sandal to the south, legend says that the crown of the King of Cumbria lays under the waters where it was hidden after the defeat of Celtic King Dunmail in the great battle between the Anglo Saxons and Celts in 945AD. King Dunmail was defeated and his crown taken up the sharp path alongside Grisedale Beck and thrown into the tarn, which is 33m at its deepest. Lanty’s Tarn is a wonderful setting enclosed by woodland on Birkhouse moor, 3 miles on foot from Glenridding. 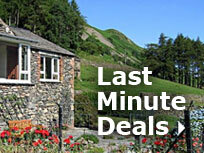 It offers excellent views of Lake Ullswater and breathtaking mountain landscapes. Located in the eastern region of the Lake District is the little lake Red Tarn, Situated at 2356 feet beneath Striding Edge and Catstye Cam. Red Tarn is one of the highest tarns in the Lake District and Cumbria and the tarn is a popular stop for hikers and campers who wish to climb Helvellyn at dawn to catch the early views of the sunrise. It was formed when a glacier on the eastern side of Helvellyn melted and is now a habitat for the rare schelly fish. The award-winning 'Ullswater Steamers' is a must-do for anyone visiting Lake Ullswater, operating cruises for 150 years on what many consider England's most beautiful lake stopping at beautiful locations including Pooley Bridge, Glenridding, Aira force and Howtown. You can hop on the steamers to make your journey around the Ullswater Way faster and easier. An unforgettable experience, the cruises are connected to many other wonderful walking routes in the Lake District National Park and UNESCO World Heritage Site. The Lake District is famed for its mountains as well as lakes, and the area near Ullswater is no different. South west of Ullswater stands Helvellyn, the third-highest point both in the Lake District and England and named 'Best British Walk' in 2018. Standing at 3,117ft (950m) in the south-west of the valley summiting Ullswater, a variety of routes up the mountain can be accessed from all directions. Walkers can expect to see glaciers and two pointed ridges on the east side, Swirral Edge and Striding Edge. In addition to the behemoth that is Helvellyn, the area around Ullswater also boasts smaller fells including Hallin Fell, Place Fell, Gowbarrow Fell, Arthur’s Pike, Bonscale Pike, Steel Knotts, Arnison Cragg, Glenridding Dodd, Great Dodd, High Street, and more. As Ullswater is a body of water, it’s an ideal place to partake in water sports and various other activities. The Glenridding Sailing Centre offers boat hire and sailing tuition from the south west shore of the lake. Available to hire from the centre are a range of kayaks, canoes, traditional sailing boats and more. Ullswater Paddle Boarding can be found on the southern shore of the lake, a short distance from Howtown. There you can complete a course to learn how to paddle board and afterwards hire your own to explore the lake from the unique standing position. It’s also possible to swim in Ullswater if you can brave the cold. Information on doing so safely can be found here. Wondering where to stay when exploring Ullswater and the Eden Valley? Whether you want to be in Penrith itself, or one of the picturesque villages lining the shore of the lake, Absolute Escapes Lettings has a number of Ullswater cottages that make perfect bases. They also regularly have special offers so you could grab a bargain. If you’d like any more guidance on exploring the area, Absolute Escapes Lettings owner Shirley will be more than happy to be your virtual travel guide. Just get in touch via email or give us a call on 01768 892777.